For planning purposes, the study area has been divided into four planning areas. Existing conditions and route alternatives for each planning area can be downloaded at links below. Within each planning area, several focus areas have been identified where there is potential to create a route that will increase access to a particular recreational or waterfront destination, and where workshop participants identified a need for pedestrian and bicycle access improvements. A set of alternative routes and treatments was explored in each case. Final recommendations for new or enhanced Greenway routes for each focus area have been made based on community feedback, field observations, previous studies and plans, and preliminary traffic engineering and analysis. 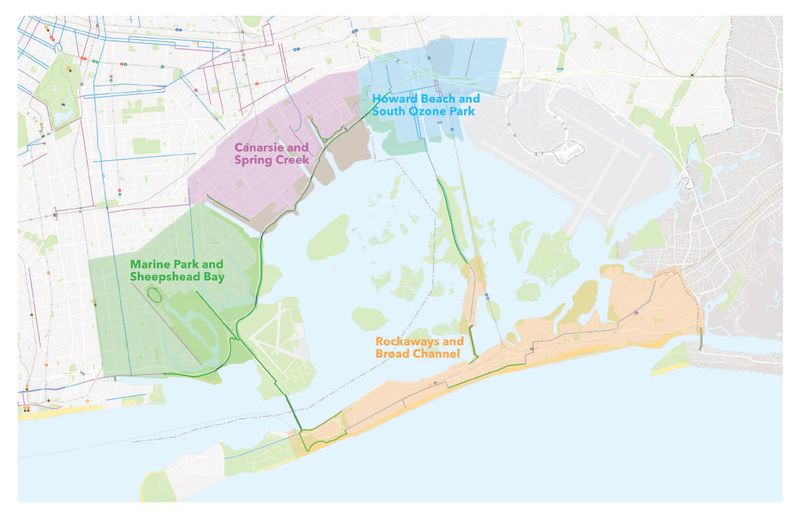 Where there has been community interest and a gap in the connectivity, recommendations are also made for potential future bicycle network expansion.